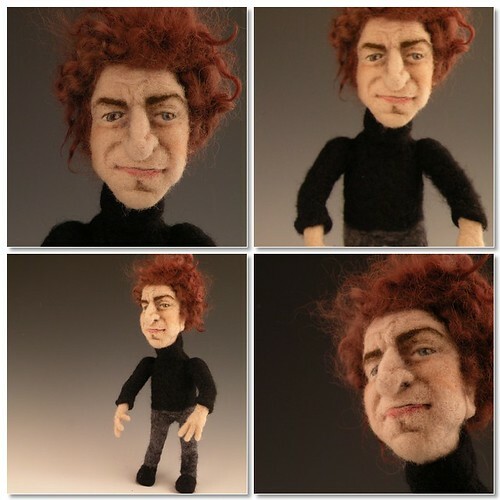 Li'l Bob Dylan in needle felted wool, originally uploaded by feltalive. I am really happy to introduce my newest li'l Felt Alive celebrity - Li'l Bob Dylan! I just love how the wool can take on the look of a rugged face and a steely-eyed expression. And curly sheep's locks seemed like the perfect choice for Dylan hair. Wow, how cool is that? I show needeld hads in my blog , too. (this week) But I don`t like to create the body! So I asked my visitors what I should do with them. No idea! My english is terrible, but I come back soon! This is a very nice blog! He's fantastic Kay you always get the likeness down to a tee.